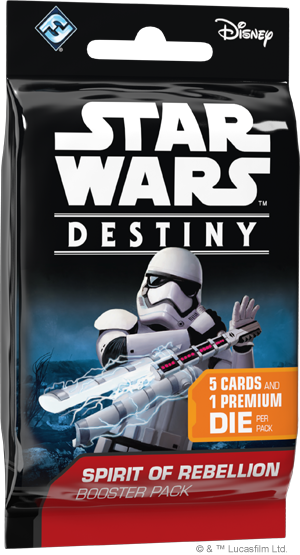 In December, Star Wars™: Destiny was released to massive acclaim! Players around the world seized their chance to enter the Star Wars universe and play out the epic duels of their imaginations with iconic characters from across the saga. In fact, the popularity of the game has outstripped all of our expectations, and the initial printing of the Awakenings set has sold out. Today, we’re excited to announce that one final limited print run of Awakenings booster packs is in the works! We’ll also reveal exactly how the printing policies for Star Wars: Destiny booster packs will work going forward. We have ordered a final limited print run of the Awakenings booster packs, arriving at retailers in June. After this print run, there will be no further printings of the Awakenings booster packs. Additional copies of the Kylo Ren Starter Set and the Rey Starter Set are already in production, and these products will remain in print until the next starter sets are available (see below for additional details). Recently, we also announced the second expansion set for Star Wars: Destiny—Spirit of Rebellion booster packs, coming to retailers in May. Expansion sets like Spirit of Rebellion and the third set (to be announced later this year) will be released in waves, which allows us to bring booster packs to retailers as fast as possible. There will be only one printing of these booster packs, and when these booster packs are gone, they will not be reprinted. After the third expansion set, at the end of the year, we will release a base set for Star Wars: Destiny. 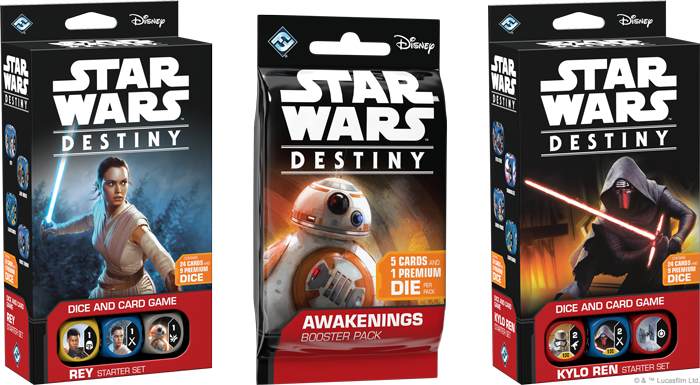 Base sets for Destiny will consist of two new starter decks (which will replace the current Kylo Ren and Rey starter decks) and a set of booster packs. This base set will provide an easy entry point for new players, while providing a foundational set to build from. The base set will remain in print for one year, at which time, a new base set will be released. Going forwards, there will be two expansion sets and one base set every year. Base sets will remain in print as much as possible for one year, after which they will be replaced by a new base set. Expansion sets will have one printing, which will be released to retailers in waves, in order to bring product to retailers as quickly as possible. Unique products may be released in addition to this, but these products will be handled separately. For more news about Star Wars: Destiny, keep checking our website.